When you delete a file on your Windows system is it really deleted? The answer is no, except if the file is on a SSD (Solid State Drive) which the file is deleted immediately. When you delete a file, it isn’t removed from the hard drive immediately. Instead, the computer marks the area as usable and it can be overwritten in the future. This means that your personal files may remain accessible, even after deleting them. For the files to be removed completely you will need to use a tool to securely delete them. With tools like Recuva , Undelete Plus, PhotoRec (command line), PC File Inspector and others the files can be restored. So say you want to completely erase the OS and files on your system as you are donating it or disposing of it. You can do this a few ways. One is using DBAN (Darik’s Boot and Nuke) which is a bootable CD that will overwrite the drive with nothing multiple times so there is nothing recoverable on the drive. According to the site “DBAN is a self-contained boot disk that automatically deletes the contents of any hard disk that it can detect. This method can help prevent identity theft before recycling a computer. It is also a solution commonly used to remove viruses and spyware from Microsoft Windows installations. DBAN prevents all known techniques of hard disk forensic analysis. It does not provide users with a proof of erasure, such as an audit-ready erasure report.” It is very effective and time consuming. Once the drive has been completely wiped you can reinstall the Windows OS using the recovery disc provided by the manufacturer. Say we just want to make sure the files we deleted are truly gone and no chance of coming back. One such tool is CCleaner from Piriform. Download and install CCleaner and click on Tools link in the left Windows pane. This will present a few new links in the main screen area. 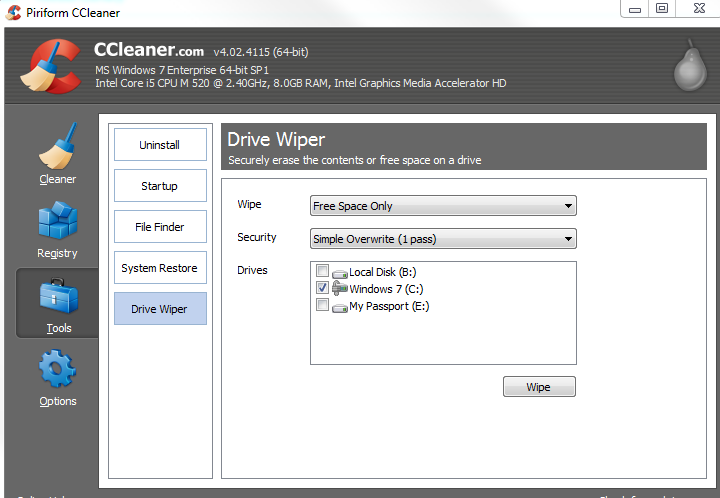 Click on Drive Wiper, select the drive to clean and click Wipe. At this point your files have been securely deleted from the drive with no chance of recovery. Another tool is Eraser from Heidi Computers. Eraser is also Freeware and runs on Windows. Download and install Eraser from here. Open the utility after installation and make the selection and let it run. These are just a few of the applications available for securely deleting files from your Windows system and should be something to get you started. Look for future posts to cover some basic data recovery techniques!